As always, I am in awe of your awesome talent. I am unfit to be "Additional Animation" in the same room with you. Or even on the same planet. Nice bugs, nice eggs, and Happy Easter to you too! awesome work guys, but what happened to the other egg?...... Keelmy?!! Whats next? tattoing my morning sausage??? STOP ABUSING BREAKFAST!!! Those turned out great! I saw at Kidrobot's store in SFC the Chicken Little egg shape series. But your's would be a great series to collect. When are we going to see more new stuff? You're falling behind, slacker! Jim: Yeah a good way to spend the evening with da gal of in your life. Kano: Very perceptive. It's my gf's 1st time ever making these things. A few didnt make it. 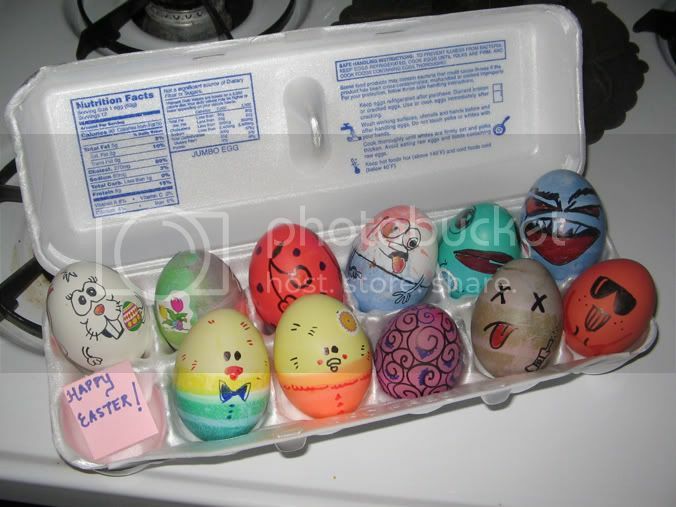 Some of the extra egss were grabbed from a different carton. Mit: I'd draw on cereal if I could. Gerald: Too bad these spoil.